Inevitably, this is the time of year most people think about sparkling wine, thanks to holiday parties and New Year’s Eve celebrations. With that in mind, here is a guide to some of the Northwest’s top sparkling wine producers, which you can use for your year-end celebration as well as any resolutions you might make about drinking more bubbly in 2013. A handful of Northwest wineries specialize in sparkling wine production. They will likely be easier to find at retailers. Domaine Ste. Michelle: This Ste. Michelle Wine Estates property is the big boy of bubbly in the Northwest, producing more than 300,000 cases per year from Washington grapes. Winemaker Rick Casqueiro works inside the massive Columbia Crest facility in Paterson, which overlooks the Columbia River in the Horse Heaven Hills. Casqueiro produces five different bubblies. Four are priced under $12, and the vintage-dated Luxe can be found for $23. DSM has strong national distribution, so finding these wines will not be difficult. Argyle: Winemaker Rollin Soles produces bubbly in a haunted former hazelnut processing plant along Highway 99W in Dundee, Ore. Unlike Domaine Ste. Michelle, Argyle’s focus is not only sparkling wine, as Soles also crafts superb still wines, including Pinot Noir, Chardonnay and Riesling. But he believes Oregon is a great place for bubbly, and he makes no fewer than five different sparkling wines. All are vintage dated, and his oldest currently for sale is the 2002 Extended Tirage Brut. Argyle wines are readily available in the Portland market, but top wine merchants elsewhere in the Northwest should also carry Argyle bubbly. Treveri Cellars: Juergen Grieb emigrated to Washington state from his native Germany in 1983 to work for Langguth Winery. After Langguth closed in 1987, he went to work for Coventry Vale, a custom-crush facility in the Yakima Valley. 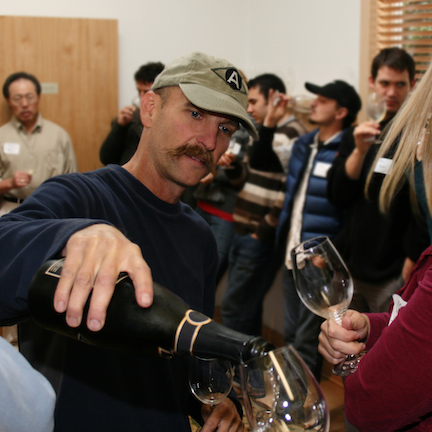 In 2010, Grieb decided to launch Treveri Cellars with a focus on sparkling wine, and he has quickly gained a reputation as one of the best in Washington. He now makes eight sparkling wines from such grapes as Chardonnay, Gewurztraminer, Muller-Thurgau, Pinot Gris, Riesling and even Syrah (that’s right, a red bubbly). Grieb has tasting rooms in the city of Yakima as well as the former Sagelands facility along Interstate 82 in Wapato. Mountain Dome: This Spokane winery has been producing sparkling wine since 1984. Using classic methods and varieties, Mountain Dome produces four different bubblies. In addition to superb sparkling wine, Mountain Dome also is well known for the whimsical gnomes that adorn the label of the nonvintage brut. Founder Michael Manz died in 2006 at age 58, but his son Erik took over as head winemaker. In 2011, the Manz family sold the winery to Don Townshend, who also owns Townshend Cellar, Caterina Winery and Lone Canary, all in the Spokane area. Summerhill Pyramid Winery: Based in the Okanagan Valley city of Kelowna, Steve Cipes has built one of the most visible and unusual wineries in North America. He ages his wines – particularly his bubblies – in a pyramid, which Cipes believes invokes an energy into the wine. Like Argyle, Summerhill does not exclusively produce sparkling wine, but it is a major focus at the winery. Regardless of what you might think of Cipes’ style and beliefs, his wines tend to be superb. With more than 1,500 wineries in the Pacific Northwest, a handful make sparkling wine on a small to medium scale. Here are a few favorites. Pacific Rim: This winery formerly owned by California maverick Randall Grahm is near Red Mountain in Washington state. It makes a sparkling Riesling called White Flowers that is delicious. Westport Winery: This winery near the Washington coast produces a fantastic and rare sparkling Gewurztraminer. It’s off-dry and goes by the clever name of Going Coastal. Karma Vineyards: Based on the south shore of Lake Chelan, Karma focuses on events and dinners. It also crafts a tasty sparkling wine. Cave B Vineyards: Based in the Ancient Lakes town of George (next to the Gorge Amphitheater), Cave B produces a Chardonnay-based sparkling wine. Hard Row to Hoe Vineyards: On the north shore Lake Chelan is Hard Row to Hoe, a small-production winery owned and operated by Judy and Don Phelps. Their winery is built on the theme of a former house of ill repute that, ahem, served miners back in the early days. Hard Row produces a delicious methode champenoise bubbly called “Good in Bed.” The 2010 vintage earned a Platinum in the 2012 Wine Press Northwest Platinum Competition. Maryhill Winery: Maryhill does not make a bubbly, but it has one made using California grapes because the demand is so high, especially during concerts. Soter Vineyards: Tony Soter gained famed in Napa Valley before relocating to Oregon. He’s best known for his Pinot Noirs in the Yamhill-Carlton AVA and also makes a delicious brut rosé. Domaine Meriwether: This winery started in 1998 with a focus on sparkling wines and was named in honor of the explorers in the Corps of Discovery. 8th Generation Vineyard: Along the shores of Okanagan Lake near Summerland, British Columbia, Bernd and Stefanie Schales make superb whites and reds. They craft white and pink sparkling wines that rate among the best in the entire Pacific Northwest. They are difficult to get unless you go to the winery, but they’re worth the trip. Unlike many other sparkling wines, these are aged under crown caps instead of corks. Road 13 Vineyards: This winery just over the U.S. border in Oliver, British Columbia, makes a superb sparkling Chenin Blanc. It is another non-cork wine (instead stored under a crown cap). Sumac Ridge Estate Winery: This longtime Okanagan Valley winery near Summerland, British Columbia, makes a couple of bubblies, led by Steller’s Jay Brut, the winery’s signature bottling. Gray Monk Estate Winery: Based in Okanagan Centre, north of Kelowna, Gray Monk is one of British Columbia’s oldest wineries. It makes a delicious brut from Riesling, Chardonnay and Pinot Blanc. Blasted Church Vineyards: Another north-of-the-border winery near Penticton, it makes a bubbly called OMG, made with Chardonnay, Pinot Noir and Pinot Blanc. Bella Wines: Few know the British Columbia wine industry better than Jay Drysdale, the longtime chef who once managed The Toasted Oak in Oliver and lorded over the wine program when it boasted the best list in the province. In 2012, he and his new bride, Wendy Rose, launched their winery which is dedicated to food-friendly sparkling wine and named for Jay’s sweet bulldog, who passed away during the summer. Bella Wines produces two bottlings — Chardonnay and Gamay Noir — at the Okanagan Crush Pad in Summerland with the help of talented consultant Michael Bartier. Neck of the Woods Winery: Located in British Columbia’s Lower Mainland, Neck of the Woods uses estate Pinot Noir to produce the only bubbly from the Fraser Valley appellation. Township 7 Vineyards & Winery: With locations in the Fraser Valley and Okanagan, this longtime British Columbia winery has made a sparkling wine called Seven Stars since its early days. Ste. Chapelle: Idaho’s oldest and largest winery produces a couple of sparkling Rieslings. They are off-dry, affordable and delicious. Camas Prairie Winery: This longtime Moscow, Idaho, winery crafts no fewer than four sparkling wines from dry to sweet. Be sure to check out Fred (“fizzy red”), a dry red sparkling made with Washington Lemberger grapes. Hard Row to Hoe Vineyards at Lake Chelan also makes a methode champenoise brut rosé called ‘Good in Bed’. Made with Lake Chelan sangiovese and pinot noir. Judy, how could we forget? Thanks for the reminder.